Scuff marks are unsightly and can diminish the appearance of an otherwise nice-looking pair of cowboy boots. Whether the boots are old or new, scuff marks must be removed to preserve the traditional appearance of the boots. Scuff marks can present themselves in a variety of colors, and may just be a tiny mark or might cover a large surface area of the boot. Regardless of the color or size, removing scuff marks is possible and can be done rather quickly. Restore cowboy boots in no time by using the proper products and methods to get rid of those ugly scuff marks. Try a gum eraser first. This is the simplest, quickest way to remove scuff marks. Gently rub the eraser over the scuff mark. It may not take all of the scuff mark off of the boot, but will at least lighten it. Moisten a soft cloth with water, if the eraser still leaves a mark. Sprinkle the cloth with baking soda. Rub the baking soda gently over the scuff marks. Wipe the boot clean with a damp rag. Follow up by buffing with a dry rag. Scoop out a bit of petroleum jelly onto a rag, if the scuff mark is still on the boot. Gently rub the petroleum jelly into the boot to remove the scuff mark. Wipe clean with a damp rag and buff with a dry cloth. 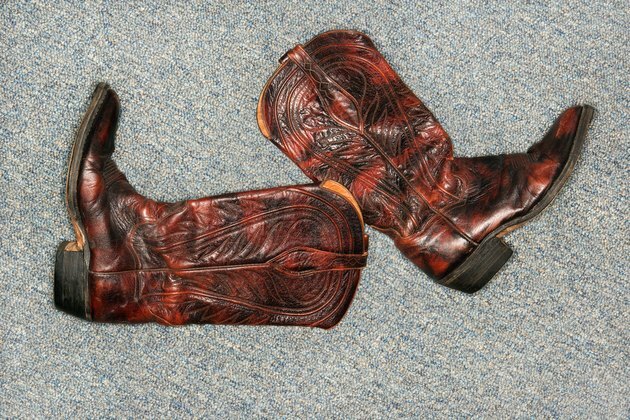 Use toothpaste for an alternative method to remove scuff marks from cowboy boots. Apply a small amount of plain, white toothpaste to an old toothbrush. Lightly scrub the scuffed area of the boot. Wipe off the toothpaste residue with a damp cloth and buff with a dry cloth. Try lavender oil if none of the other methods have worked. Not only will lavender oil remove the scuff marks, but it will also restore shine to the boots. Place a few drops of lavender oil onto the scuffed area of the boot. Rub the oil in with a dry cloth until the scuff mark disappears. There is no need to wash or dry the boot after applying lavender oil. Cover up the scuff mark as a last resort. Try to match the color of the boot with an acrylic paint, crayon or felt-tip marker. Paint right over the scuff mark. Always test the product you are using on a small, inconspicuous area of the boot prior to applying it to a more noticeable area.